Home Games Just relax and have a fun with Dropozoid on your iPhone! Just relax and have a fun with Dropozoid on your iPhone! New puzzle game for iPhone and iPod touch called Dropozoid 1.2 has just been released. The developer of the game play INNOWEBTECH LLC promises unique experience with entertaining puzzle game that seems to be challenging and relaxing at the same time. In case you prefer logic games, Dropozoid offers the play where you need strategy and solving logic problems. If you want to relax, play without any strategy just with intuition. The idea of the game is to clear game field from all blobs and as in less moves it will be done the better result will be received. During the game each blob grows and then bursts into four pieces. Orange bulb grows into pink, pink itself in green and the last in blue giving separate blobs by dividing into four pieces. This small pieces stimulate the growth and colour of other blobs and this process does not end until the whole field is clear. 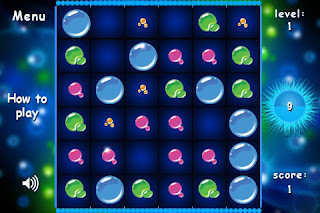 The game has an endless number of levels but the number of moves are limited. Every time you click on a blob or an empty area number of moves decreases, However, if single move bursts two blue blobs, the number of available moves is increased by one. The game logic is simple you have to burst all blobs one after another if you want a good result but a well thought-out strategy is needed to get maximum score. Additionally the game offers clear interface, nice-looking design, simple rules and relaxing classical music.